Letters of Note: What makes you think I hate the British? What makes you think I hate the British? An inquisitive letter from a Kansas City resident provoked this insightful typewritten reply from Mohandas Gandhi in 1925. 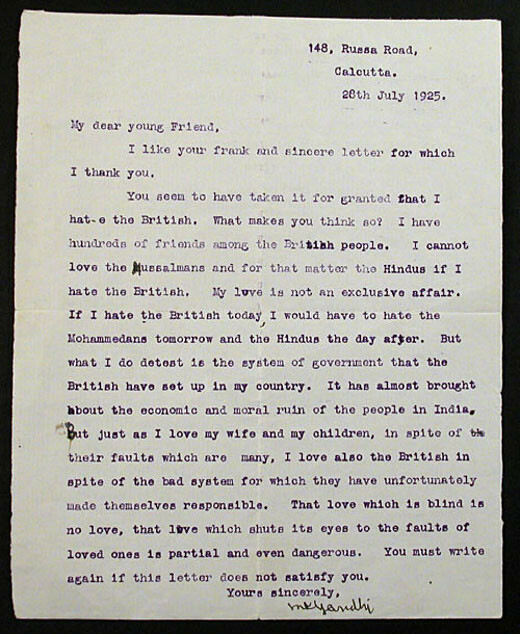 Written to a Fred Campbell just over a year after being released from prison - he had served two years of a six year sentence following his promotion of the Non-cooperation movement - Gandhi took the opportunity to personally respond to the allegation that he 'hated' the British people. I like your frank and sincere letter for which I thank you. You seem to have taken it for granted that I hate the British. What makes you think so? I have hundreds of friends among the British people. I cannot love the Mussalmans and for that matter the Hindus if I hate the British. My love is not an exclusive affair. If I hate the British today, I would have to hate the Mohammedans tomorrow and the Hindus the day after. But what I do detest is the system of government that the British have set up in my country. It has almost brought the economic and moral ruin of the people of India. But just as I love my wife and children, in spite of their faults which are many, I love also the British in spite of the bad system for which they have unfortunately made themselves responsible. That love which is blind is no love, that love which shuts its eyes to the faults of loved ones is partial and even dangerous. You must write again if this letter does not satisfy you.